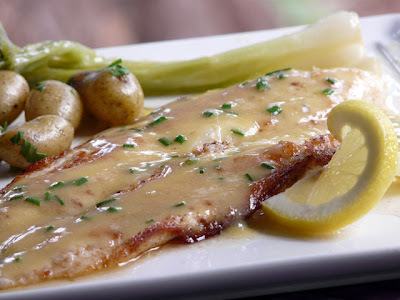 Last night we had it pan fried and topped with a beurre blanc sauce. Garnished with chives. Sides were fingerling potatoes, baby leeks and broccoli. The vegetables were all fresh from the local Farmer's Market. 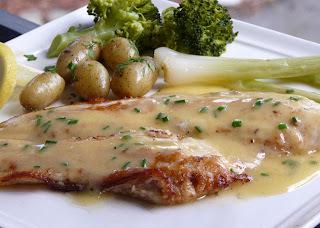 Most Beurre Blanc sauces are made with reduced white white, vinegar or lemon juice but I like to use just white wine, lemon and a little chicken broth. I find that the chicken broth mellows out the flavour a little and besides, I've never cared for a vinegar flavour. Add the minced shallots to the white wine, chicken broth and lemon juice and simmer until reduced to about 1 tablespoon. Strain out the shallots and return to the pot. Add the butter one tablespoon at a time stirring to incorporate the butter into the sauce. Keep adding one tablespoon at a time. Be careful to not let the sauce get too hot or the butter will separate. 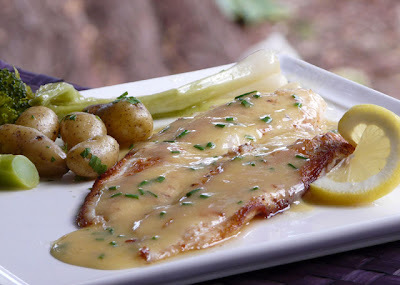 We really enjoy fish and eat more and more of it.. what a clean style Ann..
Mmmm beurre blanc! I can never describe just how amazing this sauce really is! You did a great job, what a heavenly meal! This looks wonderful. 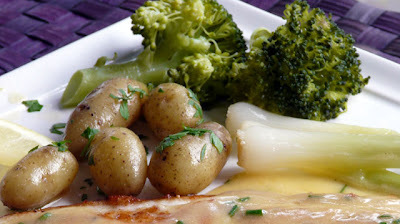 We have been eating more fish, also, and this would be a great way to prepare it. Thanks!